Alex @ Digital Matter: SensorData - Sigfox & LoRaWAN - Rain, Temp, RH. SensorData - Sigfox & LoRaWAN - Rain, Temp, RH. Both devices have soil moisture probes. These are from our partners at Aquacheck. The devices will talk to any SDI-12 sensor. This gives the soil moisture, as a percentage, from 6 sensors within the probe. The probes are about 1m long and buried in the ground. One has a Digital Matter Ambient Sensor. This measures temperature and relative humidity. One has a tipping rain gauge attached to a digital input. The device counts the tips as pulses. Each pulse is 0.2mm of rain. Both are getting a GPS fix every 24 hours. They are all polling the sensors every 30 minutes. They read the sensor values, and transmit them on their respective networks. 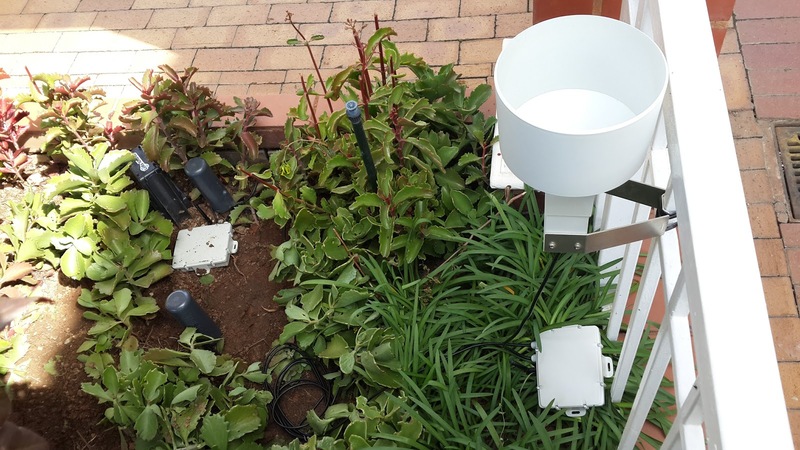 LoRaWAN - Comsol runs a public network in SA. We can see 6 gateways from the office. They use Actility in the background. Here is the pulse count on a graph - each pulse is a rain gauge tip. Each tip is 0.2mm. Jo'burg is dry now, so this is us putting some water through it. Soil Moisture. 6 sensors reported as percentages. Temperature and humidity. Jo'burg has glorious winter weather!